A titanium implant (blue) without a nanofiber coating in the femur of a mouse. Bacteria are shown in red and responding immune cells in yellow. CREDIT: Lloyd Miller/Johns Hopkins Medicine. 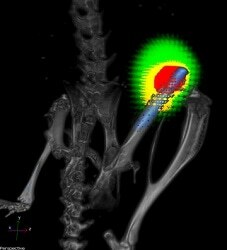 Researchers at The Johns Hopkins University have conducted a proof-of-concept study with mice to show the potential of a novel coating prepared with antibiotic-releasing nanofibers to prevent certain acute bacterial infections caused during total joint replacement surgery. A report on this analysis was conducted on the knee joints of the rodents, and was published online in Proceedings of the National Academy of Sciences in the week of October 24. However, the researchers added that this technique would have “broad applicability” in the fields of implantable medical devices such as stents and pacemakers, as well as orthopedic prostheses such as knee and hip total joint replacements. The researchers further added that unlike other coatings being developed, the new material can discharge different antibiotics in a strategically timed manner to provide a favorable effect. We can potentially coat any metallic implant that we put into patients, from prosthetic joints, rods, screws and plates to pacemakers, implantable defibrillators and dental hardware. For years, biomedical engineers and surgeons have been looking for effective ways to minimize the probability of infections during the implantation of artificial knee, hip, and shoulder joints, including antibiotic coatings. In the United States each year, infections due to the formation of biofilms follow approximately 1% to 2% of over 1 million knee and hip replacement surgeries. Biofilms are layers of bacteria that adhere to a surface and form an impenetrable and dense matrix of sugars, proteins, and DNA. Immediately after surgery, a serious infection results in redness and swelling that is usually treated with intravenous antibiotics. However, in certain patients, persistent low-grade infections last for many months, resulting in bone loss. This may consequently lead to implant loosening and eventual failure of the new prosthesis. As such infections are highly difficult to treat, in many instances of persistent infection prostheses should be removed and patients must be put on long antibiotics courses prior to implantation of a new prosthesis. Miller indicated that the cost to treat a biofilm-associated prosthesis infection in a patient usually exceeds $100,000. The disadvantages of the prevailing methods of local antibiotic delivery to implant medical devices, such as spacers, antibiotic-loaded cement, powder, or beads, are that these can normally release only one antibiotic at a time and not in a well-controlled manner as well. Therefore, Miller worked along with Hai-Quan Mao, Ph.D., to develop an improved process to address such problems. Mao is a member of the Institute for NanoBioTechnology, Whitaker Biomedical Engineering Institute and Translational Tissue Engineering Center, and a professor of materials science and engineering at the Johns Hopkins University Whiting School of Engineering. For the past three years, both researchers worked toward designing a thin, biodegradable plastic coating with the ability to discharge different antibiotics at desired rates. The coating comprises of a nanofiber mesh that is embedded in a thin film; where the mesh and the thin film are composed of polymers used for degradable sutures. To test the technology’s potential to arrest infection, the nanofiber coating was loaded with a combination of the antibiotic rifampin with one of the following three antibiotics: linezolid, daptomycin or vancomycin. Then, the researchers applied each combination to coat titanium Kirschner wires (a kind of pin used in orthopedic surgery to secure bone in place following wrist fractures), inserted the wires into the knee joints of anesthetized mice, and introduced a strain of Staphylococcus aureus, which is a bacterium known to be the common reason for biofilm-associated infections during orthopedic surgeries. The researchers engineered the bacteria to discharge light, enabling noninvasive tracking of infection over time. According to Miller, after 14 days of infection mice that were administered with the antibiotic-free coating on the pins registered plentiful bacteria in the infected tissue surrounding the knee joint, and around 80% registered bacteria on the implant surface. Conversely, after the same time period in mice, none of the mice that were administered with pins with daptomycin-rifampin or linezolid-rifampin coating had detectable bacteria in the surrounding tissue or on the implants. We were able to completely eradicate infection with this coating Most other approaches only decrease the number of bacteria but don’t generally or reliably prevent infections. Each of the rodent’s adjacent bones and joints were removed after the two-week test for further analysis. Miller and Mao discovered that in addition to prevention of infection, the bone loss normally occurring near infected joints and resulting in prosthetic loosening was completely eliminated in mice that were administered with pins that had antibiotic-loaded coating. Miller stressed the importance of further analysis to test the safety and efficacy of the coating in humans, and to find out which patients can be best benefited from the coating, for example, people with an existing infection in prosthesis joint receiving a new joint as replacement. The polymers used by the researchers to produce the nanofiber coating have been previously used in various devices such as drug delivery systems, bone plates, and degradable sutures, approved by the U.S. Food and Drug Administration. Apart from Miller and Mao, the authors of the research also include Alyssa Ashbaugh, Xuesong Jiang, Jesse Zheng, Andrew Tsai, Woo-Shin Kim, John Thompson, Robert Miller, Jonathan Shahbazian, Yu Wang, Carly Dillen, Alvaro Ordonez, Yong Chang, Sanjay Jain, Lynne Jones and Robert Sterling of The Johns Hopkins University. Financial aid for this research was provided by a Nexus Award from the Johns Hopkins Institute for Clinical and Translational Research, which was funded by the National Center for Advancing Translational Sciences and the National Institutes of Health Roadmap for Medical Research.